Something about saber though is that like a few other verbs, it changes meaning slightly in the preterite. We’ll go over more on this later but it although you might think it translates to ‘knew’, it actually means ‘found out, learned’. Please note that saber can also mean ‘to taste‘ in Spanish. This is not mentioned in the video, but should be noted by students. Present: ‘¿Cómo sabe la comida?‘ How does the food taste? Preterite: ‘¿Cómo supo la comida?‘ How did the food taste? Let me know if you have any questions, comments or suggestions about this video. That’s very true. Since I hardly use it that way, I kind of forgot about it for the video. I’ll put a note in the description… ¡Gracias! Thanks, these videos are really helpful! Nosotros sabemos un poco Venezuela. 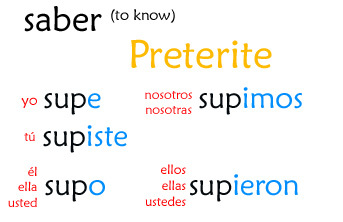 I thought that we should use “conocer” to describe a place that we know. Right. But notice the ‘de’. I am not saying I am familiar with Venezuela as in I have been there. I am saying I know about Venezuela. You could also use sobre to mean about in that sentence. thanks a lot for these helpful video, really great effort. I would like to ask you about the pronunciation of saber, why did you pronounce it “saver”? I know that “v & b” in Spanish pronounced b, so could you please make it clear for me?